The mugs and one package of tea ended up being free and I simply *had* to buy two more flavours to try out! Thank you Stephanie - I've already tested out a mug for my morning coffee. Perfect! - I know many of us find that avoiding the twist that often happens when we're starting our circular knitting is a challenge (hate to say how many times I've started over). 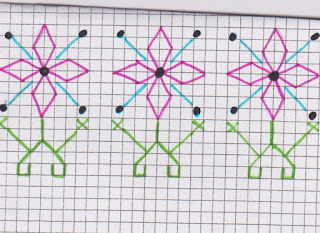 Came across this wonderful tip and thought I'd share - Simply knit 2 or three rows straight and then join in the round. It's much easier to see that you have a twist and avoid it that way. 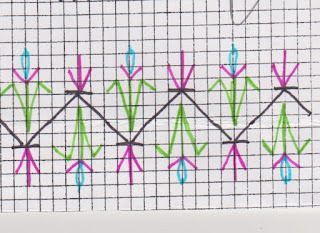 Those couple of rows then can be joined together when you are stitching in your ends. Genius? 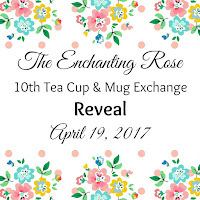 - Sandy of the blog Quill Cottage is about to teach her very first online class entitled "An Artist Field Kit" and it's amazing!!! Go HERE to see a short video about what she'll be sharing with her students (how I wish I could take part in this one!!). Even if you don't plan on taking the class go and see anyway!! 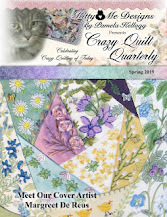 - Kathy Shaw has once again opened online registrations for her beginner's crazy quilt class (it's FREE!!) but you'll have to hurry to get in! Go HERE for further info on that. - Pam Kellogg has released the latest in her Inspirational Sampler Series of cross stitch designs and this one is very patriotic! Go HERE for that. Today your quote is form an anonymous source...."I love days when my only problem is tea...or coffee"
It's worked with an 8mm crochet hook so works up really quickly. - HERE's a free crochet pattern that would be perfect for using up stash! Today your quote is from an anonymous source..."Attract what you expect. Reflect what you desire. Become what you respect. 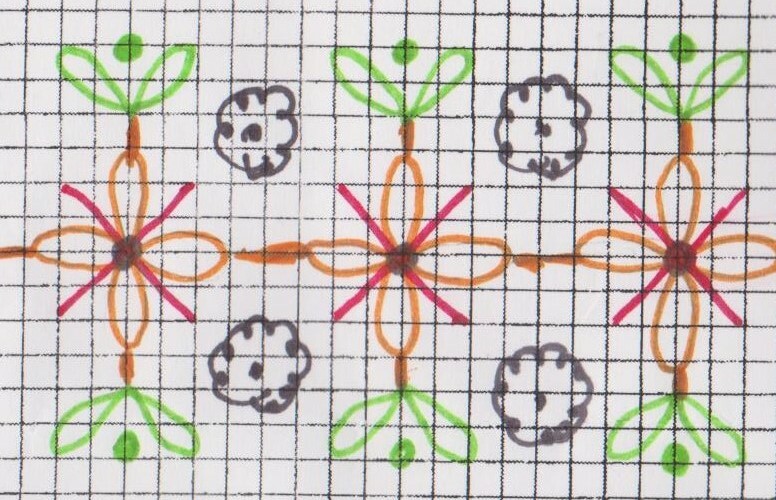 Mirror what you admire"
Straight stitches (pink); fly stitches (light green); lazy daisies (darker green); cross stitches (yellow) further 'crossed' with straight stitches (orange). 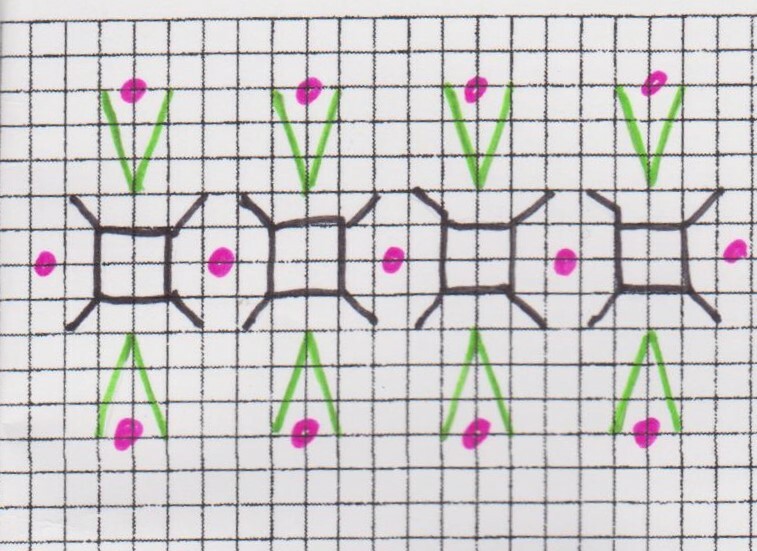 Half cross stitches (black); woven with metallic thread (pink); and beads or French Knots. Next time I will show you more of the fillers and soon I will be starting into the final block (actually, in 'real time, I'm working on it now, but I'm a bit behind in my sharing with you). I also want to show you what arrived at my door yesterday....a box filled with absolutely gorgeous mohair yarn - all the way from Lithuania! I have been asked to make several items of baby clothing which our #2 son and daughter-in-love will use as props for their photography business. This yarn is absolutely luxurious!! Can't wait to start to play with it! - There's a great tutorial HERE for joining the first and last stitch when knitting the first row in the round. 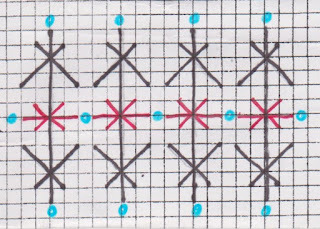 - For those of you who have trouble counting rows in your knitting, perhaps you might find the tips HERE to be of value. If you're wanting to learn to knit I see she also offers a free online class. - I am in need of a larger system for storing my circular needles and of course I fell down the Pinterest rabbit hole in quest of ideas and came across THIS. I'm not going to use it, but it certainly gives you pause for thought. There are lots of ideas for needle storage HERE as well. Back in 2011 I made myself a smaller storage case which I really liked and then I further re-vamped it to make it much roomier for a gift for a friend. Of course, being of not sound mind, I didn't keep the pattern I used for the small one and since I cobbled the large one together I don't know if I can repeat it. Duh! Anyway, if you want to see what I'm rabbiting on about go HERE. Today your quote is about knitting and comes from Melanie Falick...."In a ball of yarn is the potential to make a dream that you have come true". This one is done with Chevron Stitch (black); straight stitches (green and pink); and lazy daisies (blue). I apologize once again for the horrendous cropping of the images - there is something odd still happening with my computer and the program and it's annoying!! Lazy Daisies (orange & green); Cross Stitches (red): French knots or beads; and I created some little ribbon roses. 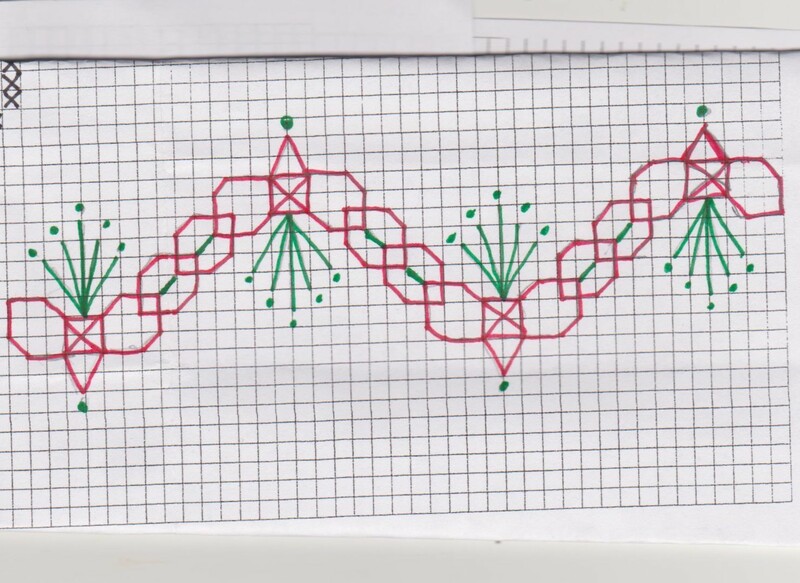 Straight and cross stitches (red and black); French Knots or beads. - There's a lovely cross stitch chart HERE for butterflies. - For those who have little ones in your lives, perhaps THIS might be a fun creation for them. There's lots of scope for design in this one too. I can 'see' a barn....or a fire hall....or a store....whatever your imagination comes up with. - Mary Corbet has written an excellent post HERE about taming and organizing your threads. Today the quote is from an anonymous source..."Anyone can make you smile, many people can make you cry, but it takes someone really special to make you smile with tears in your eyes"
Not going to chance it! These came entirely from my stash, always a bonus....the green ones are flannelette and the middle one is recycled denim. The pattern I used is from jRoxDesigns for Craftaholics Anonymous. Really easy and quick to make. I embroidered a rooster on the denim one because the wee little boy is of Asian descent and 2017 is the Year of the Rooster. - For those of you who like owls, how about making one of THESE? I'd love to have one hanging in my window! - I came across this great way to make your own fabric labels which would be perfect for adding to your sewing and knitting projects. Go HERE for that. - And because it's finally spring here in this part of the world, I think THESE would make a perfect addition to your decor! - If you want to pour yourself a cup of your favourite beverage and then go and spend some time perusing THIS pinterest board, I guarantee you will find some amazing embroidery projects. Definite eye candy!! Today the quote is from Pablo Casals..."The child must know that he is a miracle; that since the beginning of the world there hasn't been, and until the end of the world there will not be, another child like him"
As an additional 'bit' about the swap I posted about yesterday, I thought I'd show you the absolutely lovely 'thank you' I received from my swap partner Marina. One of the 'rules' of the swap is that you send a thank you card to your partner, but imagine my surprise when I received a fat envelope in my mailbox and out tumbled some amazing things! Just look at the treasures she sent! First of all she wrote a lovely letter on that pretty flowered paper (which will be saved for use in a creation later on); the beautiful cross stitched violet sachet (and the stitches are teeny tiny too! ); the pretty cross stitch sewing-themed pattern; two beautiful quilt-themed postcards with quotes on them; AND some gorgeous buttons!! Thank you Marina!! Phew, what a struggle THAT was! Either that or she's PMS'ing!! - I wonder if kangaroos are going to be the next 'thing'? Have a look at THESE little cuties. - There's a great tutorial HERE for making your own duffle bag - lots of uses for this one! 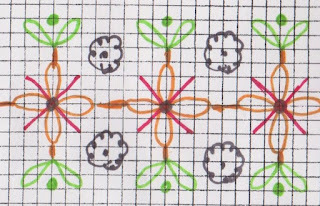 - THIS is a really sweet pillow pattern - could also be used as trim on a skirt I think, or a wallhanging. - How about an easy-to-make bunny that simply uses a knitted square? 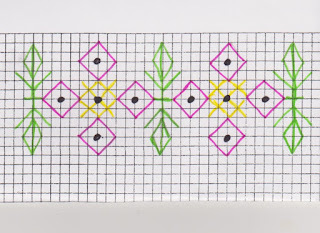 - Kathy Shaw has issued a really pretty quilt pattern called 'Weaving Ribbon' and you can find out more HERE and she's also opened registrations for her latest free online class concerning ribbon embroidery and you can find the information HERE. As usual, she's only leaving the window of opportunity open for a very short while so you'll have to act fast. 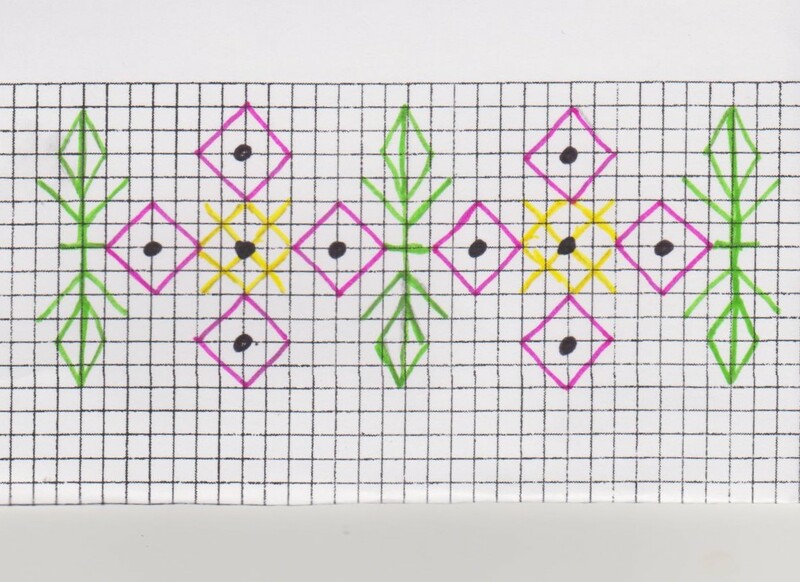 - And Pam Kellogg has another in her Inspirational primitive cross stitch sampler patterns available and you can read about that HERE. - If you are interested in making your own books, perhaps you might find THIS post about easy bookbinding techniques of value. I went searching for a quote about frustrations with computers and came across this one by Paulo Coelho..."Life has many ways of testing a person's will either by having nothing happen at all or by having everything all at once" and I was satisfied with that one, but THEN I found THE perfect quote by Peter Drucker... "The computer is a moron"
I'm so excited that today is the big reveal day for sweet Stephanie's (of The Enchanting Rose blog) 10th Tea Cup and Mug Exchange! I have wanted to play along with this for a couple of years and finally mustered my courage and signed up - and I'm so happy I did! Each participant sent, and received, a lovely parcel from their swap partner and I'm happy to be able to share what I sent, and received. First of all, my 'send-to' partner was Marina (who unfortunately doesn't have a blog) and I had such fun putting a parcel of goodies together for her. She shared that she collects things pertaining to birds and has a lovely Black Lab dog and a pet sparrow. She wanted a mug so the hunt began. I initially searched for one with a bird theme and perhaps some flowers to make it prettily feminine. The hunt came to a screeching (almost literally) halt when I came across THE most absolutely perfect meant-to-be mug that featured not only birds but a black lab too!!!! I was so excited!! There's a lovely mug featuring flowers and a deer from their area in France; an assortment of flavoured teas and hot chocolates (which I'm happily enjoying!! ); my favourite chocolates; some pretty fabrics; the sweetest little mouse ornament (which just happened to be attached to some chocolate); and a lovely little tea bag holder, also from her area in France. I use the tea bag holder every single day! Thank you Sandra!!!! And finally, and big thank you to Stephanie who very capably organized us all. 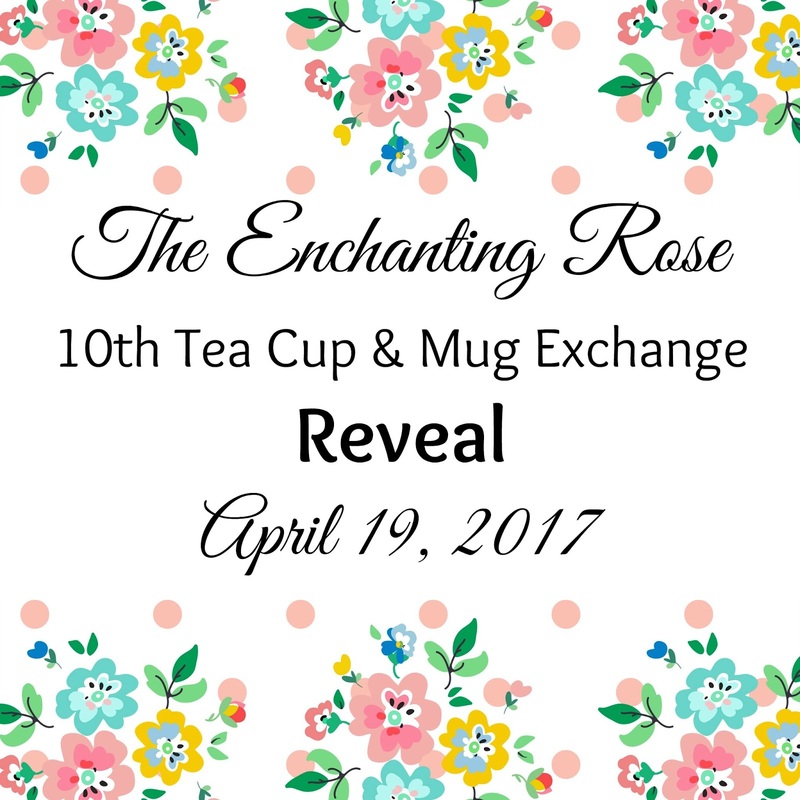 There were over two hundred participants (!!!) and I'm sure it wasn't an easy job to pair everyone and keep tabs on us all. I'm so glad I played along!! The shoebox I had is now full and there should be lots of play value inside. Mind you, with little kids you never know just what they'll end up playing with! And...just to prove that I'm also doing other things, how about a peek at what my living room floor currently looks like? These are the pieces for the sweater I'm knitting for #2 son...blocking on the floor for lack of space elsewhere! - I was having a few issues with my new sewing machine with the thread breaking and thought I was going to have to take it back to the store. I had a light bulb moment and wondered if it could be a bobbin issue and once I used one of the bobbins that came with the machine the problem stopped. Hmmm. Then I stumbled across THIS great article and it seems I might be on the right track. - If you have a little person that happens to like fairies, perhaps you'd like to create a magic little house for them to live in from the pattern found HERE. - You can find some interesting ideas for backing a quilt HERE. - If you have to shorten a pair of jeans, have a look at the great helpful hint found HERE. - Another sewing hint HERE for an easy quick way to gather fabric. I don't know about you but I can't count how many times my thread breaks when I try to make gathers. This idea looks like a perfect solution! Just scroll down a bit in the post to find the how to. - For those of you who (gasp) do something weird called 'spring cleaning' perhaps you might find the tips HERE of use. - And I have to thank Judy for passing THIS along - if you like jigsaw puzzles, be prepared is all I'll say!! entries appearing in my inbox!! Your quote for today is from Walt Disney..."Laughter is timeless, imagination has no age, and dreams are forever"
Blessed Easter wishes to you all. Continuing the felt food fun! Today there are a couple of donuts and some french fries. I used the french fry holder pattern from HERE, but I think I will make it a bit larger in order to be more in line with the size of the 'fries'. - For those of you that are interested in doll-making, perhaps you'd like to check out the resources and classes on offer HERE . 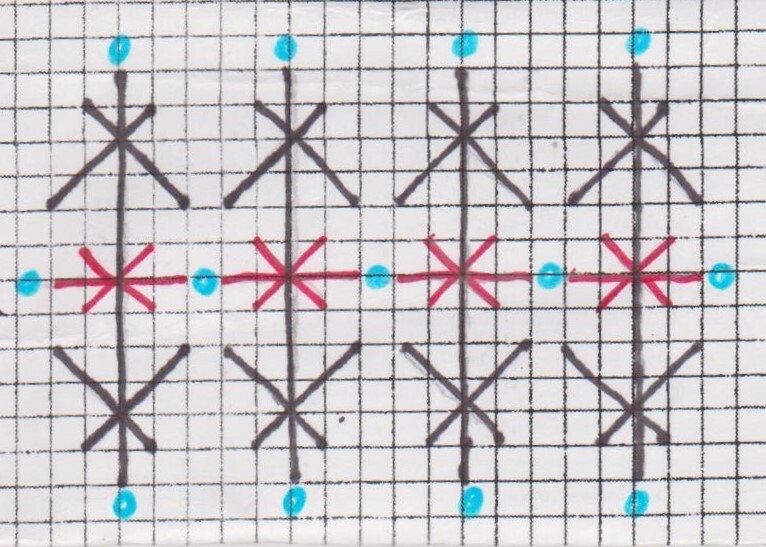 There is also another good source for patterns and resources HERE. 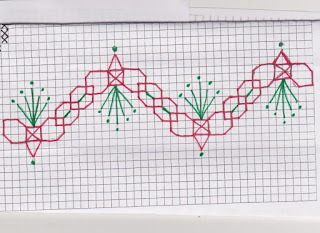 - There's a nice pattern available HERE for a bag that some might find interesting (and useful!). - THIS one is interesting too - I can 'see' it as a perfect carry case for a doll and her wardrobe - or maybe to store fat 1/4's - or whatever your imagination might want to do! 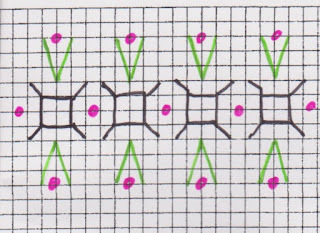 - And HERE is another really nice bag pattern. Today your quote is from Plato... "Excess generally causes reaction, and produces a change in the opposite direction, whether it be in the seasons, or in individuals, or in governments"
In hindsight I should have made an entire pizza pie that would end up fitting together, but I didn't have enough felt for that. 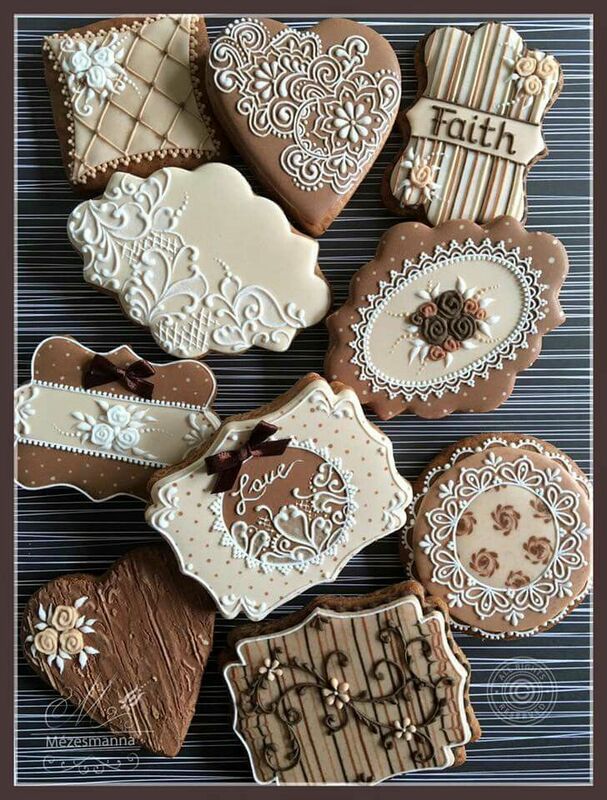 Yesterday I discovered a few amazingly decorated cookies and now I have a few more for you to drool over HERE, HERE, HERE, HERE, and HERE. After all that sugary indulgence, I won't give you any more mumblings today! Your quote is from George Bernard Shaw..."Progress is impossible without change, and those who cannot change their minds cannot change anything"
Further in my playing about with creating felt food for #1 grandson, how about some breakfast? I kind of suspect that Grandma is having just as much fun making these as he will playing with them...maybe even more. - For those of you who like Temari - either to create yourself or just plain admire, THIS is a great site. - THIS little hand sewing hint is probably something most are aware of, but perhaps not....so I'm sharing, just in case! Sometimes it's the simplest things that make all the difference. - THESE fall under the awwwww category. Hard to imagine that they're edible! Or how about THIS one? Definitely too pretty to eat! And you can go HERE and scroll through all the amazingly decorated cookies. Yesterday we had pretty much perfect weather - sunny and warm - although we did end up with a thunderstorm passing through. 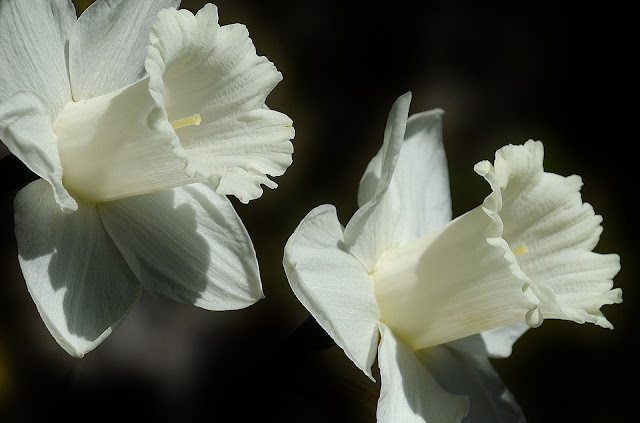 So, in light of the fact that maybe (just maybe) spring might be here....your quote today comes from Virgin A. Kraft..."Spring shows what God can do with a drab and dirty world"
Our #1 grandson will be turning three soon and he got a play kitchen for Christmas. Of course Grandma needs to make him some food to go along with it! First 'up' is a burger with fixin's. The white 'blob' you see is reversible - it's supposed to be mayo with ketchup on one side, and there's mustard on the other. - Talk about a work of art (and a labour of love)!!! Have a look at THIS beautiful mosaic wall created by Vicki Welsh. She has spent a very long time creating it and the amount of detail is incredible. 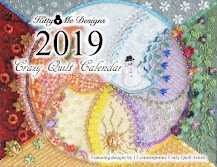 - Kathy Shaw has opened online registrations for her latest BCQC-2 crazy quilting class and you can find further information on that HERE. - For those of you who happen to like foxes AND tea, how about making yourself one of THESE? 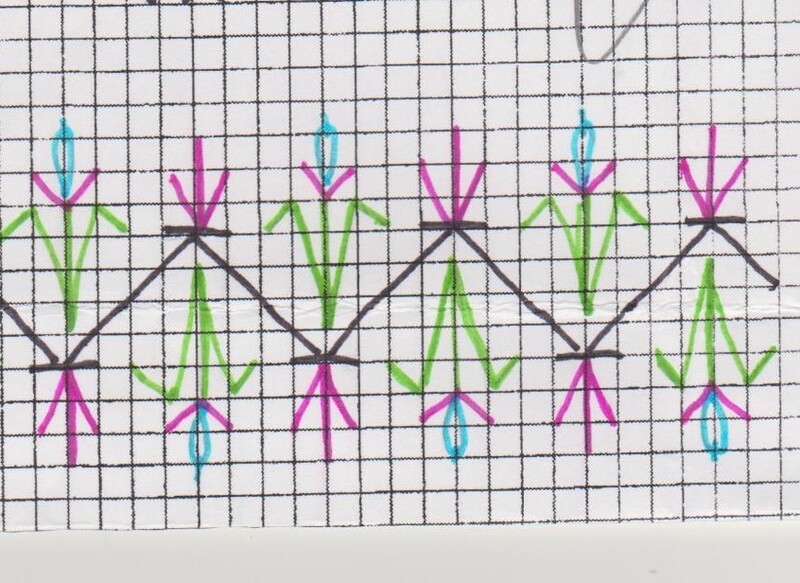 (Pattern link is at the bottom of her post). Or if you like sweet little bunnies how about THIS one? 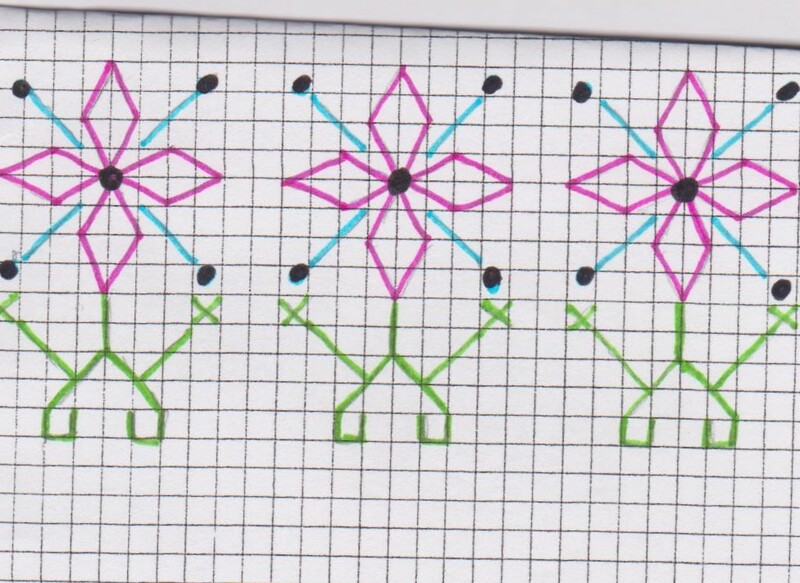 - HERE's a cute cross stitch pattern for Easter Eggs - they show them on a towel, but they could be used anywhere you like. - Pam Kellogg is introducing a new series of inspirational counted cross stitch patterns and you can find out more by going to her blog post HERE. Today your quote is from Steve Maraboli...."A new day: Be open enough to see opportunities. Be wise enough to be grateful. Be courageous enough to be happy"
This one is pretty much straight stitches, with some French knots or beads. A really simple version - all straight stitches and beads. Again, all straight stitches with some added beads. - I came across THIS site this morning and there's lots of good stitching information there. Might need to pour a cuppa' before you visit! 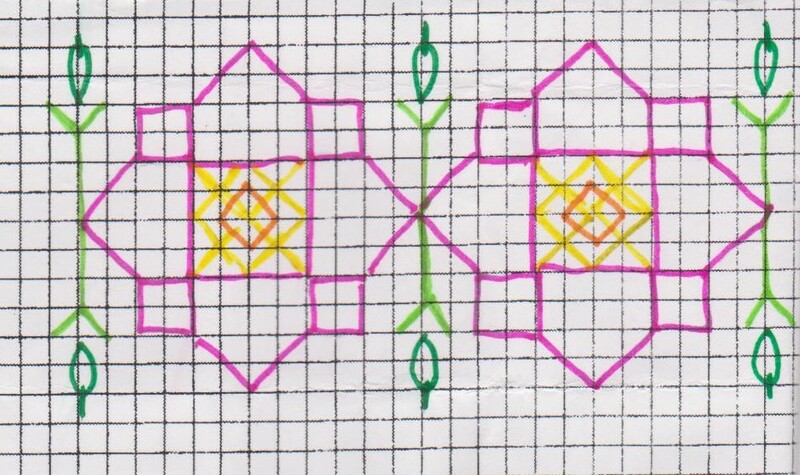 - For some reason my mind went into retro-mode this morning and I got thinking about doing bargello, oh so many years ago. I did a lot of pillow covers using the technique and I loved it. Of course it's one of those things that seemingly has fallen out of favour now. I am wondering though - if it wouldn't be something that could now be worked using waste canvas. Might be a tad difficult to remove the threads though, come to think of it. Anyway, HERE's a sampler to show you what I mean. 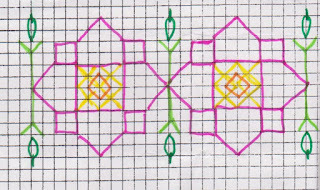 - A far more modern interpretation of bargello are now being done with fabrics and there are a number of free patterns HERE. If you want more, have a little fall down the Pinterest rabbit hole and see some of the stunning variations that are being created. And, because I wasted so much time this morning down that particular rabbit hole, how about this quote for today from an unknown source...."Regret for wasted time is more wasted time"
First of all, I want to thank those of you who were kind enough yesterday to pop over to MiaMusa Photography and 'like' them on facebook. I know our daughter-in-love and our son are thrilled that you would be so nice to them and their fledgling business. Thank you!! This one was done with straight stitches, a few little cross stitches, and then I added French knots and some beads. 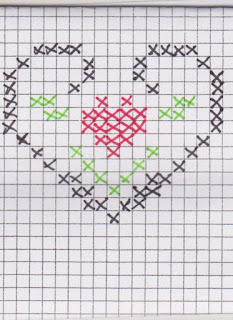 The heart within a heart was all done with cross stitches. You could remove the middle heart and use flowers instead (silk ribbon would be lovely!). 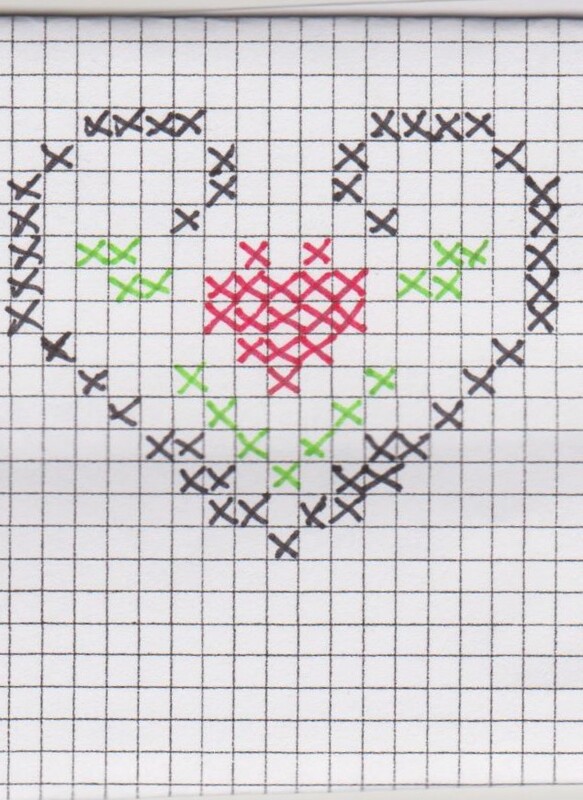 - HERE is a cute little Easter cross stitch design for you. And HERE is another sweet little Easter design (although I'm eyeing the flowers thinking they'd be wonderful on their own). - THESE fall under the awwww category! There's a translate feature so you can read it in English. 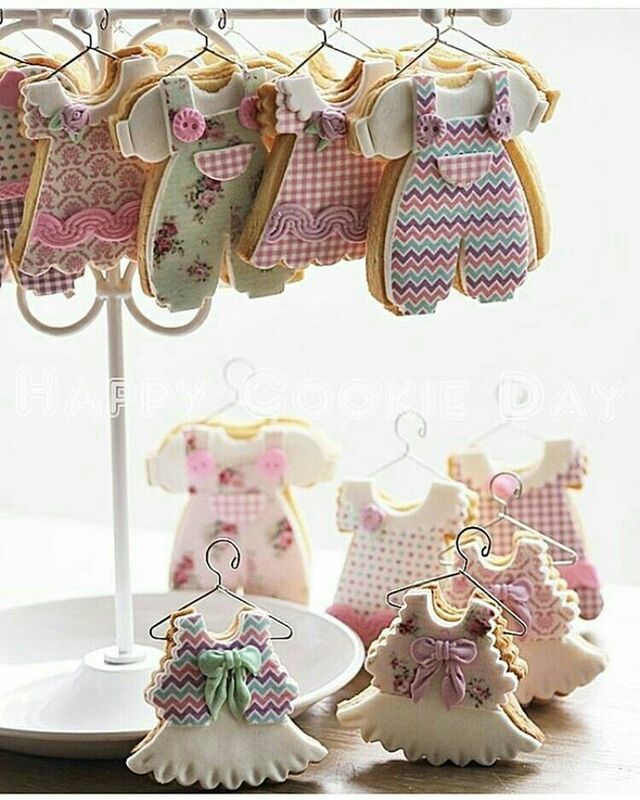 And THESE would be so sweet to keep a little one occupied. - And just for the fun of it, how about making THIS cake for Easter? Kids would love it! - There's another really pretty and practical shawl pattern available HERE. Since I started the courtship series, I've been wrestling with ideas of how to finish the blocks off and I have a few ideas floating about in my brain - one of which I would like to tackle, but not at all sure it will work. Came across this quote this morning and perhaps it's telling me something??? It's from Mandy Hale..."You don't always need a plan. Sometimes you just need to breathe, trust, let go and see what happens"
Block 5 - complete! And more shameless begging.